Our Saviour’s is a community united in the journey to know, serve, and walk with Christ. Our Saviour’s Lutheran Church is a congregation of the Evangelical Lutheran Church of America. Through ELCA membership, Our Saviour’s is a part of one of the largest Christian denominations in the United States, with about 4 million members in nearly 10,000 congregations across the United States, Puerto Rico and the U.S. Virgin Islands. 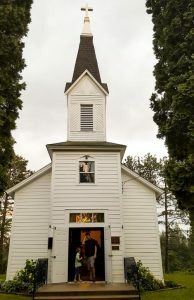 Life was breathed into The Swedish Evangelical Lutheran Church of Ham Lake in 1872 when a small group of charter members expressed great determination to organize a parish in this community. The name of that community of faith was later changed to Our Saviour’s Evangelical Lutheran Church of Ham Lake, and now is officially Our Saviour’s Evangelical Lutheran Church of East Bethel. Video footage of Founders’ Day at the Chapel is available on YouTube at Founders’ Day. Shortly after the date of organization, a church building was erected on the Johan P. Magnuson homestead. Today we refer to that church building on Swedish Drive in Ham Lake as the Our Saviour’s Chapel. Worship is conducted there on Christmas morning, the Sunday morning before Memorial Day (celebrated as Founders’ Day), and Wednesday evenings at 6:30 p.m. throughout the summer (from the Wednesday after Memorial Day through the Wednesday prior to Labor Day). In 1964, with faith and vision, the church relocated Our Saviour’s on 5.9 acres of land donated by Eddie and Martha Pearson on County Road 22. The bell, which rang occasionally in the first church, was moved to the new site. Our Saviour’s on Viking Blvd. Our congregation continued to grow. By the late 1990s, we had overflowed the space in our County Road 22 location. The journey of transforming our vision statement, “Growing the family Tree of God,” into a new larger church began in 2000 with the search for suitable land. 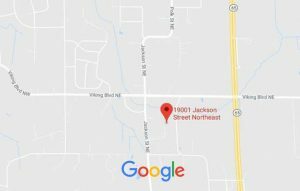 In 2002, 53 acres of farmland just south of Viking boulevard were purchased from Earl “Bud” and LaVerne Anderson. Bud is the great-grandson of Johan and Fredricka Magnuson, donors for the first church site! The journey continued with the new church dedication on July 18, 2004.